By this time, we already know what Sony Xperia handsets will receive the Android 7.0 Nougat update. On the other hand, the arrival of the update is still unknown to the masses. 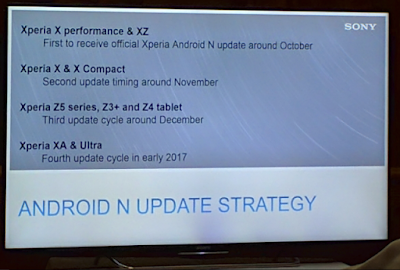 Now, during a presentation, Sony Slovakia has just leaked the company's plan regarding the schedule of the Xperia handsets. 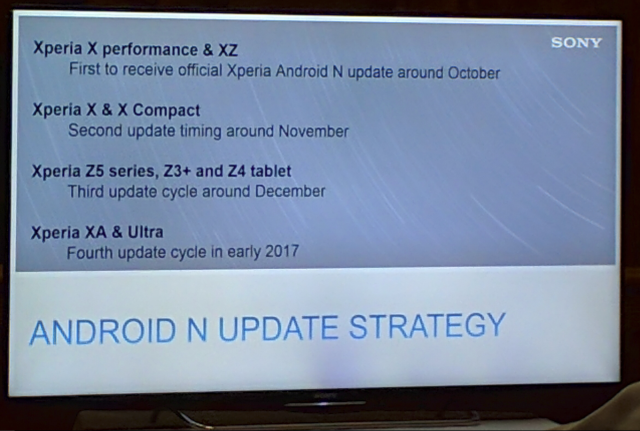 Based on the leaked image, Sony plans to get the Android 7.0 Nougat update to the Xperia X Performance and the Xperia XZ around October. Furthermore, the Sony Xperia X and Sony Xperia X Compact are planned to get the update in November. For the third update cycle, the Sony Xperia Z5 series, the Xperia Z3+, and the Xperia Z4 tablet will get the Nougat update sometime in December. Lastly, for the Xperia XA and Xperia Ultra, the fourth cycle update will come in early 2017. Most flagships, during their course and lifespan, will most likely receive the next iteration of Android. If you're rocking a Sony Xperia Performance or Xperia XZ, you may be able to check and see if the update has arrived via OTA. However, should the update come in waves of rollouts, which is likely a possibility, you can probably check a couple of forum to do things manually if you have the know-how.